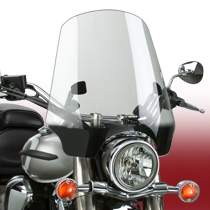 The Street Shield™ and Street Shield EX™ are your windshields of choice when your height or riding position requires a bit more coverage than our popular Deflector Screen™ offers. Both feature our patented NoHole Ballsocket™ technology. 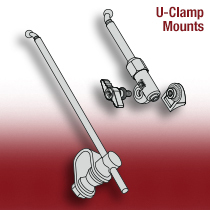 A sturdy four-point mounting system with height adjustment fits almost any bike and any rider. Our Street Shield™ Windshields fit an incredibly wide range of makes/models dating back more than 50 years. The applications are just too numerous to list here. 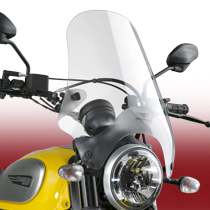 Use the SHOP main menu option to select your specific year and make and model to see the Street Shield Windshield applications and fitments for your bike. 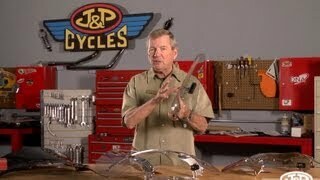 Polycarbonate or Acrylic? YOU Decide! Our newly upgraded, Quantum® hardcoated polycarbonate Street Shield™ features a solid 4-point mount that attaches to tubular handlebars and upper fork tubes with your choice of U-Clamp Mount System or QuickSet™ Mount System. QuickSet gives you the ability to remove and store the windshield quickly and easily when you prefer to ride with the wind in your face. A simple twist of the QuickSet knobs and the shield is off — in seconds! 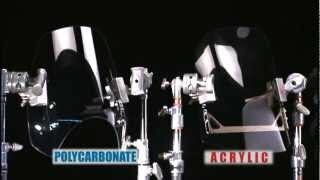 The traditional Street Shield EX™ windshield with QuickSet™ Mount System is one of our best sellers. 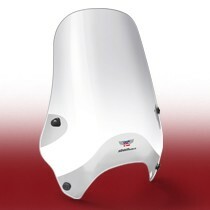 Made with 4.5mm High Impact Acrylic, it's taller and wider than our standard Street Shield and provides the rider with excellent upper body protection. The Street Shield™ is constructed with state-of-the-art injection-molded polycarbonate with Quantum® hardcoating for superior impact and crack resistance, as well as unbeatable scratch resistance. The Street Shield™ is available in Clear and 25% Light Tint. Made from Quantum® hardcoated polycarbonate. DOT and ABE Approved. All hardware is included. Both mount systems include hardware for 7/8" (22mm) and 1.00" (25mm) handlebars. 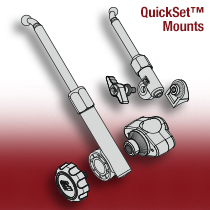 QuickSet Mounts for 1.25" (32mm) handlebars are optional. 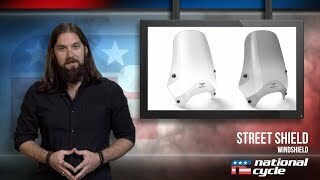 The Street Shield EX™ is made from 4.5mm High Impact Acrylic and uses our QuickSet™ Mount System with either 7/8" (22mm) or 1.00" (25mm) hardware. All hardware is included.